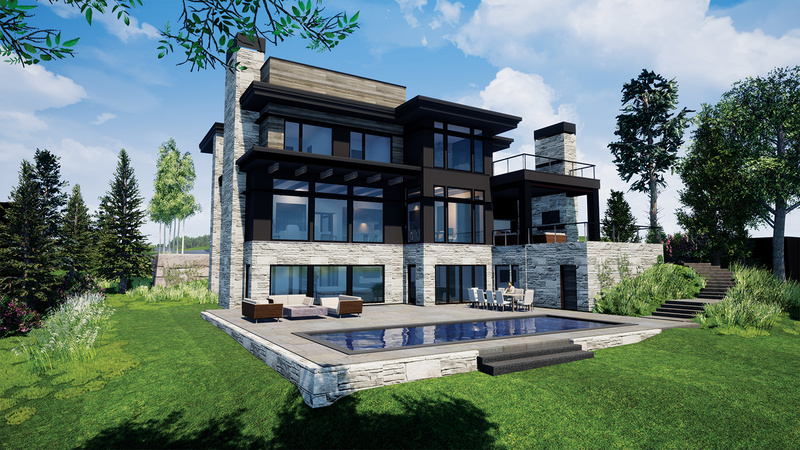 Located on Lake Minnetonka’s Maxwell Bay, this 7,812-square-foot home in Orono is surrounded by stunning lake views. The deep property offers the best of lake living with a distinctly “up north” feel on a private, heavily wooded lot. When the homeowners need a dose of city life, shops and restaurants in Wayzata, Mound, and Excelsior are only a short drive away. The five-bedroom, seven-bathroom home, built by Stonewood, LLC, was designed to feel contemporary, with the warmth of rustic touches. A modern floor plan designed by architecture firm Eskuche Design features metal, glass, and a tone-on-tone palette that is complemented by reclaimed wood and stone accents throughout the home. A stone clad wall bisects the home side to side, with steel-framed openings from the foyer to the living spaces. A steel spiral staircase with thick timber treads and open risers creates a bold, modern look, and a glass and steel elevator adds greater convenience and flash. The owners’ goal was to create an open main level that provided as many sight lines of the water as possible. The main entertaining areas in the home have sprawling views of Maxwell Bay with floor to ceiling windows facing the lake, while walk out access to a large screen porch on the top floor provides even better views of the lake. Retractable sliding doors on the main level open to an additional porch with a fireplace and outdoor kitchen. A pool, large patio, and wine cellar offer even more entertainment options while also taking in the gorgeous surroundings.